Wheel of train has a projection called Flange to prevent the derailment of the train. Frictional wear of this point relates to the critical derailment. So, their thickness, diameter and weight should be confirmed regularly. Wheel of train is always affected to vertical and horizontal force against the rail, and the derailment will be occurred by over run the rail, if horizontal force is bigger than vertical force. This relation has been known as Nadal formula, equation (1). Coefficient of derailment (Q/P) shows that this larger value means possibility of derailment is also bigger. For measurement the diameter of wheel of train, measuring instrument, TY-50, has been used. We can see the diameter easily by setting it on the wheel. Digital tire instrument, TOD-400, is applied to measure the flange height and thickness. These data are displayed as digital value on its screen by installing it at point of the flange. At the point of preventing derailment and downfall, a ratio of static load of wheel should be managed. Based on the managing standard in Japan, ratio of static load of wheel is better within 10%. 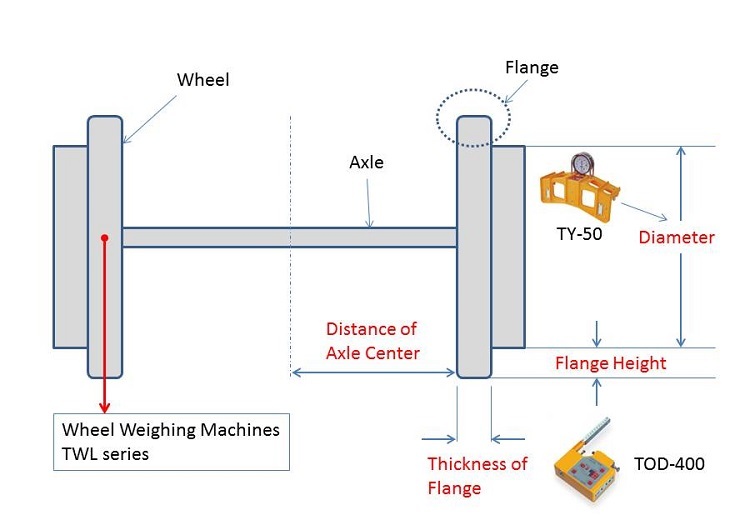 Measuring instrument for wheel weight, TWL, has been applying to calculate their weight. To find the trouble signal of the rail, vibration recorder, called UHA, is used. Vibration on the base of train is measured by this device and feedback to rail maintenance if unusual data are recorded. Measuring data is captured the acceleration waveform directly at real time viewing, and it can print the maximum data out at that time. Moreover, various analyses can be conducted on the software with PC.